Ramakrishna Beach 5 km away from the main city and situated on the cost line of Andhra Pradesh along with natural splendor is one of the most included places in the Vizag tourist place. Actually this is the extension of the Coromandal coast of India. It is the largest stretch of seafront. With the nature of its soft sand makes it an ideal place to spend time and relaxing the twin beach Ramakrishna beach and Lawson’s Bay makes the tourist mind blowing scenic view of the nature attraction especially the reddish color sun setting. The specialty of this beach is that it satisfies all classes of people with taste ranging from water sports, sunbathing to a person to a person seeking a lazy holiday. A local cruise can be hired to enjoy the sunset and sunrise. Apart from this the traditional fishing boat hiring the local fisher folk. The Ramakrishna Beach would become an inseparable part of your cherished memories. Lawson’s Bay beach also known and Pedawaltair Beach. The calm secluded beach with greenery and golden sands located. The shallow crystal clear water and calm waves here is perfect for swimming, sun bathing and surfing. The impressive sea with Shallow crystal clear water and calm waves here is perfect for swimming, sun bathing and surfing. A beautiful beach and the vast blue sea that falls on the way to Kailasagiri Hill. You can enjoy the a few laps of swimming, as the current is quite low. Rishikonda beach situated about 8 km away from the Vishakapatnam city is the most beautiful beaches of Andhra Pradesh. Spread wide with golden like sand and tidy waves of Bay of Bengal. The tourist are attracted with the scenic beauty. This is a perfect place for water skiers and surfers. This appearance of the sand as gold makes it a perfect destination for those who love sun bathing. Possessing a vast stretch of water. Lined with green plants. This beach attracts many nature lovers and adventure lovers. The perfect time to enjoy the beach is at the time of Holi. On this day local people gather here for a celebration, smearing the beach with the colors of holi which makes this beach more lively. On a Trip to Rishikonda Beach you can also enjoy facial massage offered by some local people. The sea foods available in the stalls near this beach are also very popular among the tourists. Different dishes made of fishes from the sea are available in these beach side restaurants. Bheemunipatnam Beach also known as Bhimili Beach situated 24 km from Vishakapatnam. This is categorized by the remains of the 17th century Dutch Fort; this portrays the early sign of the Dutches here. Blue waters, tall coconut trees, peaceful environment makes an ideal spot for newly wed . History says that Bheema one of the pandavas brother slew the devil Bhakasura. As the act of killing took place therefore it is named as Bhimunipatanam beach. Bheema celebrated his victory by mounting statue of goddess lakshmi on top of the hill. Ananthagiri Hills one of the most popular tourist destinations in Andhra Pradesh. Ananthagiri Hills is an ideal place for the nature lovers . Located 60 km away from Vizag with rich in flora. With distinct varieties of greenery found in these hills. It will be on the way to Araku. With an altitude of 1168 meters. Tourists not only from India but also from other parts of the world come here to enjoy the nature and charming beauty of hills. The coffee plantation will greet the tourist around the roads that lead to Anantagiri. Anathagiri offers one of the most unforgettable landscapes from thick forest to glittering sunrise and sunset. It is considered to be a perfect head off to get away from the blistering summer months. Poised at an altitude where the panoramic landscapes with stunning viewpoints. The magnificent climate attracts bounteous throughout the year , quite few accommodations available at the hill. Driving through the charming coffee plantations with the roads ups and downs on the road with rich in mango groves, waterfalls. Dotted with trees and swift flowing streams makes the hill station a wonderful place to relax. Visiting to Ananthagiri hills can be planed all through the year. Kailasagiri is located on the hilltop. This is an outstanding tourist spots in Andhra Pradesh and can be called as Queen among the tourist locations. Situated at an altitude of 360 ft and about 380 acres of land with exciting landscapes, gardens rich with flora and tropical trees. And also can be said most distinguished place among movie makers. A rope way from the foot of the hill takes you to the top where one can enjoy the panoramic view of the entire city. The main attractions over here are Lord Shiva and Parvathi statutes stands at a height of 40 feet, floral clock, Shanku-Chakra Namas of lord Venkateshawara , Food court. The floral clock is one of the biggest in India with a diameter of 10 ft. The shanthi ashram on top of the hill, here one can earn peace to their mind and body by meditating. An exclusive butterfly park, highest man made water fall adds the attraction. To make pollution free the VUDA has imposed on ban on plastic, but never imposed rules to follow, but people voluntarily following the rules. One more attraction added is toy train operating train at the hill top park. This train takes the circular tour of the garden for 20 minutes. Ideal time to enjoy will be in the winter season. The compartments are fitted with transparent glass at the top and sides. Feel lucky if you get the tickets on the left. Konda karla Ava also known as lovers paradise is 60 kms from Vishakapatnam is the second largest fresh water lake in the state and has been recognized as Eco Tourism Destination. This Kondakarla Bird sanctuary surrounded by green hills has large verity of species of birds. And the best place for bird watchers. And if you make your time to be there early in the morning you will get chance to see different varieties of birds. Best Time to visit this place is during December to March when large number of birds are attracts from all over the planet. The bird sanctuary established here has a large varieties of bird species. The coconut trees at one side and green hills all around gives you peace of mind escaping for air and sound pollution. Request the local fishermen and you will get a boat ride for a nominal fee and if you happen to take a boat ride don’t forget to go on the other side of the lake to see the temple. This place is calm and peaceful. You can experience the exciting moments by having a boat ride where you can cherish your memorable moments. One has to cautious, don’t expect much here because you won’t find anything near ava. This place is to enjoy the natural beauty. Visakhapatnam has another golden feather in its tourist attraction. The Submarine Museum-Kurusura at Ramakrishna Beach has a specialty. The submarine is a first turned to a museum whole of Asia and Second in the world. This is a Russian built museum on December 18, 1969. This submarine started its journey on February 20, 1970 via Baltic Sea and reached Vizhakapatanam on May 11. 1970, since then it has been used by the Indian Defense. This Submarine is turned to museum on February 2, 2001. It was brought to the sands of the vizag beach shore. India's Premier Defence Lab - National Ship Design and Research Center (NSDRC), Oil and Natural Gas Corporation (ONGC), Visakhapatnam Port Trust (VPT) and other organizations have extended their helping hands in bringing the submarine to the sands of the beach and facilitating the conversion into a museum. INS Kusura served for about 31 years before it was decommissioned and retired from nation's defense services. India is country Kown as sub continent and this can be proved on the lines of the three hills. One Hindus great and most powerful god Lord Venkateshwara Swamy, Second the almighty lord Jesus and Great Muslim saint Sayed Ali Medina alias Ishaque Madina. It has been visited and venerated by Hindu and Muslim devotees alike. The hill on the south of the line of three hills, called Sri Venkateshwara Konda has a temple dedicated to Lord Venkateswara. It is believed that this temple was built by European Captain Blackmoor in 1866 according to the telugu inscriptions. From here one can view the port Channel, supposed to be the entrance of the harbor for ships and liners. 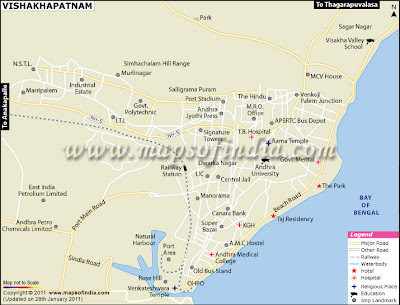 Visakhapatnam not only famous for its beautiful scenic places but also for religious centers. Darga Konda is a sacred place in the north of the three hills at the entrance of the harbor. The mosque of Muslim saint Sayed Ali Medina alias Ishaque Medina a highly respected Muslim saint who was revered for his prophecies is place in this hill. People believe that the Saint Medina had miraculous powers. The darga is visited by both Muslim as well as Hindu devotees. When people are fighting in the name of the religion, this darga stands testimony to the still existing bond and peace belonging to two different religions. The Araku valley is located on the Anathagiri Hills at a height of 1161 mts from the sea level . The natural beauty comes live with rich landscape, pleasant weather, hills and valleys. And all these are at one place ARAKU VALLEY. Araku is 112 km from Vishakapatam district of Andhra Pradesh. The journey to this place will be interesting, exciting and pleasant with forest on either side of the road. With 46 tunnels and bridges to greet the tourist. The best way to plan reach Araku valley is form Visakhapatnam by taking train ticket for Vizag Kirandul passenger train. During this journey one can enjoy the beauty of the vally, tunnels and bridges. There are around 17 tribes living in this valley with their traditional colorful dress and most interestingly untouched with modern civilization. Their rhythmic songs and tribal dance, Dhimsa Dance are just marvelous. On the way to Araku there is one more place called Anathagiri Hills which is famous for coffee plantation. And nearly 29 km away from Araku there is Borra Caves which is another famous tourist attraction. This borra caves is famous for its million-year-old stalactites and stalagmites. Araku is a small beautiful valley located around 112 km from Vishakapatanam amidst Eastern Ghats. The valley was formed by the hills at an altitude of 1300 meters above sea level. When one thinks of trip to Vizag the first thing comes in mind is Araku valley. The valley is connected both by rail and road, but most of the people prefer to rail as it is considered one the best passing through a range of tunnels and valleys. The view on the side of the tracks is so magnificent and allows the travelers to get a glimpse of the unexplored sides of the area. Araku is mainly inhabited by the local tribes. There is also a tribal museum which is worth seeing as it houses a range of handicrafts and artifacts of the life style. The valley is not only perfect for trekking, joy, relaxation but apart from this beautiful landscape around to enjoy as a nature lover. The valley has moderate climate which has neither too hot nor too cold. However, during summer the temperature is does rise, humidity also increases. Winter will be quite comfortable with minimum humidity. Best time to visit Araku is during winter with less humidity. Ananthagiri ghats with thick forest clean air and peaceful surrounding. Matsyagundam an interesting pool near the village Matham. Small siva temple on the back of the river. The museum showcases the life style of the tribal’s who are inhabitants of the valley. The museum with charming red-roof bungalow gives the picture daily life style of the tribal’s. Each and every place in the museum will greet the visitor with realistic sculptures of tribal’s in their natural habitat that on many occasions feel as if they are real human beings. Some of the sculptures are like a tribal woman cooking the evening meal and another feeds her child and a male tribal watches the family with a spear in hand. Padmapuram Botanicla garden has historical importance located on the Araku road. It is believed that the garden used to provide vegetables to the soldiers, who fought in the second world war. Now called as Botanical garden acts as a horticultural nursery that contains various rare types of flowers and trees. The highlight of the padmapuram botanical garden is the toy train gives the entire tour to botanical garden. Apart from toy train it has also hanging cottages (Tree top huts) can be booked by the tourists. The garden also has rose garden and varied species of plants are also on sale. Matsyagundam popularly known as “fish pool” located in Araku valley. This place is home for varieties of fishes and a century old Siva temple known as Sri Matsyalingeswara Swamy Temple. The myth is that There was a fight in a palace called Gemmili between Singarajulu(Snakes) and Matsyarajulu (fishes). the mother fish rescued all the fishes and came here. After the arrival of the mother fish the name Matsyagundam was given. It is believed that still the fishes are being protected by matysalingeshwara swamy. Owing to this belief the villagers neither eat nor hunt fish. Rock climbing, trekking and target shooting with bow and arrows are main attractions here. With the help of Guide we can learn language of jungle., like identification of calls, marks etc. Understanding the features of various floras and fauna. To attract the tourist long huts and tents are set in tribal environment. Chaaparai is a well known picnic spot in Araku. A charming place with water fall with forest surrounded makes more interesting and joyful for the people to relax. People who visit Araku will make it a point to visit. You can enjoy the water flow by entering into the flow, but only to remember one thing is that you should not enter the water flow during rainy season as the water flow will be more and can prove to be dangerous. You can enjoy the water flow during wither when the flow is less. Landscapes and gardens are located in the surrounding places. One can experience the beauty of water flowing through the natural rocks. This is just 15 km from Araku on the way to Paderu. This is the most dramatic scene Galikondalu (Hawa pahaad) viewpoint is a must stop for the panoramic view it offers. The view point is about 3,800 ft above sea level. The highest point of Araku Velley. Egend has it that this site was a battlefield years ago when kings of Oddisa and Andhra Pradesh fought to retain it. And finally, it was retained my Andhra Pradesh. It has a cloudy mist in the distance and slate blue mountains all around. This is the famous place for Tourist attraction its importance in shooting place for movie makers. The hills are with red soils and nearer to Bay of Bengal. This is said as red hills because of the soil nature. Borra Caves or otherwise called Borra guhalu (In Telugu Borra means Hallow and guhalu means caves). Borra caves is one of the tourist happenings in Andhra Pradesh. Situated on Ananthagiri hills. These caves are million years old formed at elevation of about 2313 ft and depth of 262.5 ft. These 300 feet thick roof caves are spread over an area of one square kilometer. Legend is that a cowherd once lost his cow when it fell through the hole in the roof. The cowherd went inside in search of his cow and found a stone that looked similar to a lingam. He referred Lord Shiva who protected the cow. Owing to this story the tribal who inhabited the villages around the caves built a temple of Lord Shiva Outside the Caves and come to this place for worship to get a glimpse of the Lingam. Some say that William King George of the Geological Survey of India found this million year old cave in 1807. The stalactite and stalagmite formations have led to a breathtaking array of naturally cut shapes. One can spot Shiva and Parvathi, a tree with it roots overhanging, a lion reaching out to make a kill, a chandelier, a mother and child, Lord Hunman, Shiva linga, human brain, Radha-Krishna and a Nandi. The shiva linga comes as a major attraction since it is said that every drop of water that combined with the calcium carbonate present here helped to form. These caves mean a lot to the tribal’s of the area who worship here, particularly on the occasion of Shivratri every year. A huge rock land resembling the shape of the dolphin’s nose and a tourist attraction in Visakhapatnam. The headland is 174 meters high and at an altitude of 358 meters projecting into the sea. It’s a single and gigantic hillock shaped like dolphin’s nose formed as a natural process. The other important thing about this rock is that it guards the Visakhapatnam harbor and Dolphin’s Nose is a huge rock land resembling the shape of a dolphin’s nose, and an eye-catching attraction in Visakhapatnam. The headland is 174 meters high and at an altitude of 358 meters, projecting into the sea. A Powerful light house positioned on the top of the hill and guides the approaching ships to Visakhapatnam. It gives out a light beam that could be seen as far as 65 kms out at sea and flashes every 10 seconds. On the banks of the river Varaha in Visakhapatnam district this Etikoppaka village is located. Etikoppaka means a group of houses on the banks of the river. This is located nearly 65 km from Visakhapatnam. This village’s population is about 12,000. Farming is their main livelihood and more than 200 artisan families live in this village. Toys which are not only meant for children, but various carvings and table lamps which cater to the needs of daily use. They make from candle stand to vermilion boxes and bangles. The make toys for different rituals. Their charming designs, bright colors and shapes are so attractive that they became part of rural folk tradition. Best Time to Visit: The best time to visit Vizag and Araku Will be During Winter with less humidity. You can plan your visit in the month of October to March. Tourism House, Himayatnagar, Hyderabad - 500 063.